From the Star Wars collection by Kurt S. Adler. Star Wars Plastic R2-D2 Full-Figure Light Set. From the Star Wars collection by Kurt S. Adler. 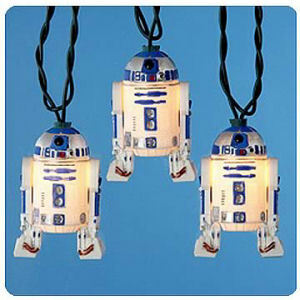 Star Wars Plastic R2-D2 Full-Figure Light Set.The Christmas lights set features 10 total lights spread out along 10 feet.Includes 4 spare bulbs and 1 fuse. Light Set is for indoor and outdoor use. Kurt S. Adler Star Wars Ornaments shipping from Canada. No Surprise Border fees or Customs!